While few Americans have high levels of trust in professional news organizations, a close look at Americans’ expectations of and relationship with the news media offers a more nuanced view. Overall, most Americans expect the news they get will be largely accurate. Yet, most also believe that news organizations will try to cover up their mistakes rather than admit to them. And while majorities of both parties believe the information they receive will be accurate, positive sentiments toward the news media are stronger among Democrats than Republicans, as seen in previous findings. About seven-in-ten Americans (71%) go into national news stories expecting they will be largely accurate, compared with about three-in-ten who think they will be largely inaccurate (27%). And while few Americans have a lot of trust in the information they get from national news organizations, this figure is in line with the portion who have at least some trust (71%). 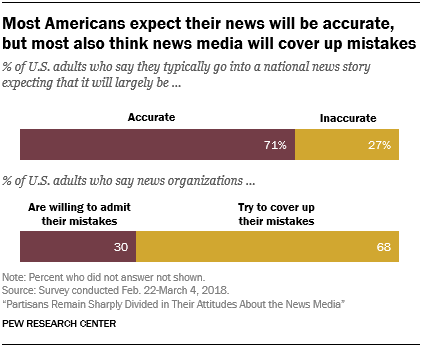 But despite the public’s confidence in the accuracy of news stories, most Americans doubt that news organizations will react in good faith when mistakes are made. About two-thirds of Americans (68%) believe news organizations will try to cover up mistakes, more than double the share who thinks news organizations will admit to them (30%). 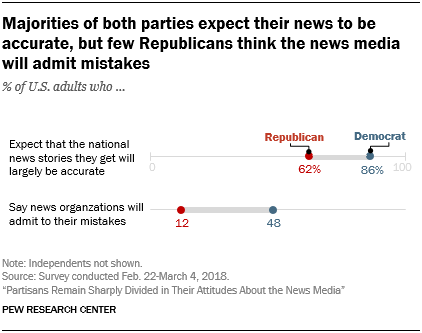 Even a majority of those who see national news as largely accurate lack faith that news organizations will admit to their missteps: Six-in-ten of those who expect news to be accurate think news organizations will try to cover up mistakes rather than admit to them. However, Americans who think their news is largely inaccurate are even more likely to be wary, with almost nine-in-ten (88%) saying news organizations will cover up mistakes. While majorities of both Democrats and Republicans believe their national news will be accurate, this view is more common among Democrats (86%) than Republicans (62%). Republicans are about three times as likely as Democrats to expect the national news stories they get will largely be inaccurate (37% vs. 13%). Republicans also tend not to have much confidence in news organizations’ integrity when mistakes are made: A large majority (86%) believes that news organizations will cover up their mistakes, compared with only 12% who say they will admit to them. Democrats, though, are about split, with half saying news organizations will cover up mistakes and 48% saying they will admit to them. Independents fall between Democrats and Republicans on both questions, with nearly seven-in-ten (69%) saying their news will largely be accurate, and about a quarter (27%) saying that news organizations will admit to their mistakes. And in what may be another indicator of trust levels, most Americans say they do not feel understood by or connected to news organizations. This sense of disconnectedness is stronger among Republicans than Democrats. 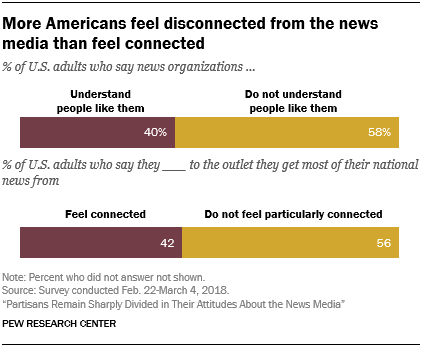 A little more than half of Americans (58%) do not feel like news organizations understand people like them, while four-in-ten say that they do feel understood. 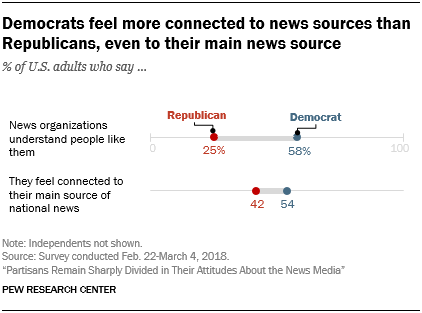 A similar portion of Americans (56%) do not feel particularly connected to their main sources of national news, whereas about four-in-ten (42%) say they do feel connected.